Intrastate Interstate 96 traverses southern Michigan from Muskegon east to Detroit. The freeway begins at a cloverleaf interchange with U.S. 31 at Norton Shores. Angling southeast from there, I-96 heads to Crockery Township where it turns east to Coopersville and the north side of Grand Rapids. Bypassing Furniture City to the north and east, Interstate 96 circles southward to Gerald R. Ford International Airport (GRR) and the east end of the M-6 freeway before resuming an eastward course to Portland. Southeast from there, the freeway parallels both the Looking Glass and Grand Rivers to combine with Interstate 69 to the west of Lansing. East from Interstate 69, I-96 spans the Grand River ahead of south Lansing to Michigan State University and the U.S. 127 freeway. Interstate 496 loops through the city, serving both the state capitol complex and Downtown. 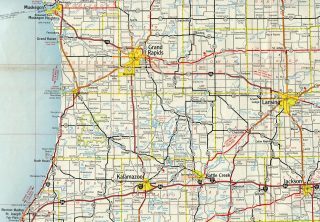 Becoming rural again, Interstate 96 leaves Lansing to pass by the villages of Webberville and Fowlerville and the small cities of Howell and Brighton. The Detroit suburbs ensue from U.S. 23 and Brighton east along I-96 to the interchange complex with Interstate 275, Interstate 696 and M-5 at Novi. I-96 turns south there along side I-275 from Novi to Livonia. 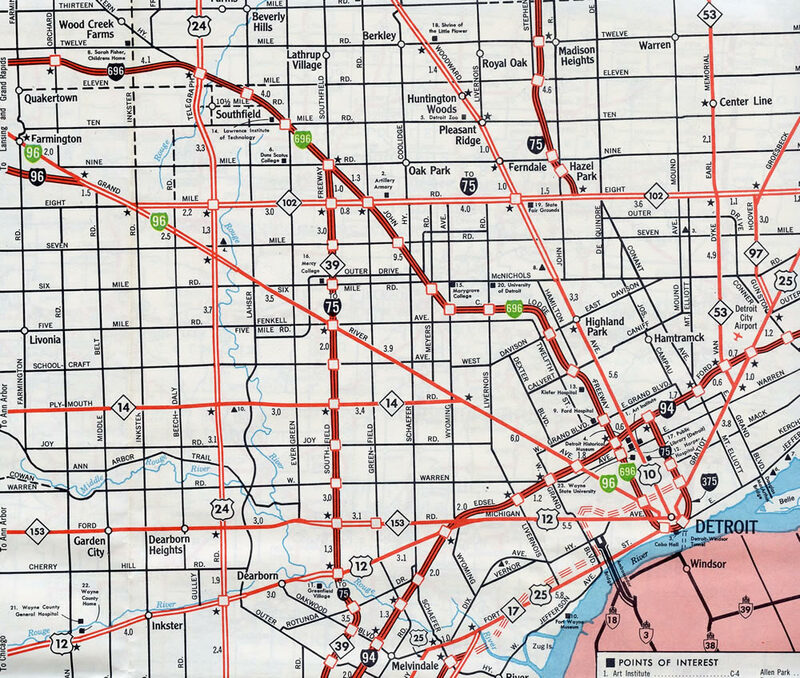 The remainder of Interstate 96 east through Livonia and into Detroit is an urban freeway, with a dual roadway section between Exits 180 (Outer Drive) and 186B (Davison Street). Beyond the three-wye interchange with M-8, I-96 curves southeast along the Jeffries Freeway to meet Interstate 94 and Interstate 75 (Fisher Freeway) before ending at the ramps to the Ambassador Bridge linking Michigan with Windsor, Ontario. Interstate 96 wholesale replaced the alignment of U.S. 16 through Michigan. The route used to cross Lake Michigan via a ferry from Milwaukee to Muskegon. It ran east to end in Downtown Detroit until 1962, when it was truncated west to Wisconsin. Originally, Interstate 96 was to begin at the Michigan-Indiana state line cosigned with Interstate 94. Once at Benton Harbor, I-96 was to split from I-94, following current Interstate 196 all the way to Grand Rapids. Northward at Grand Rapids, Interstate 96 was to have turned onto its existing alignment toward Lansing and Detroit. 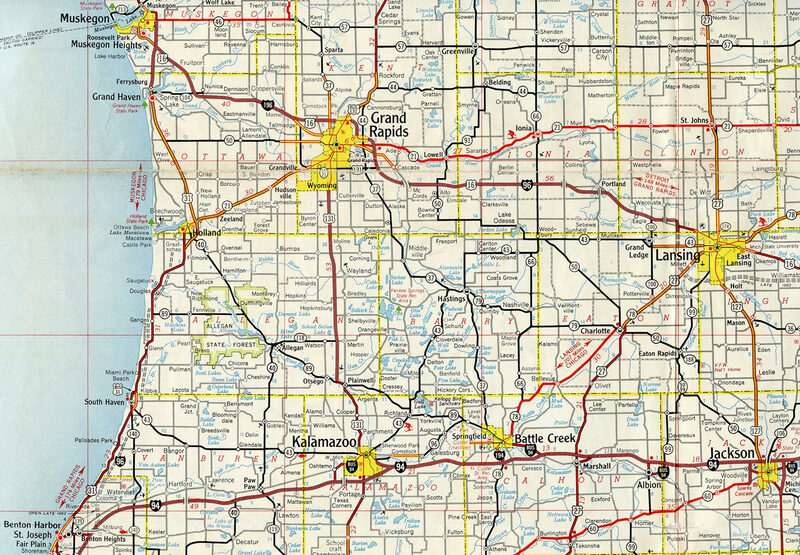 Interstate 196 then was defined to include what is now I-96 between Muskegon and Grand Rapids. Changes were made in 19631 when I-96 and 196 west from Grand Rapids traded places. AASHTO approved the change on June 23, 1969. 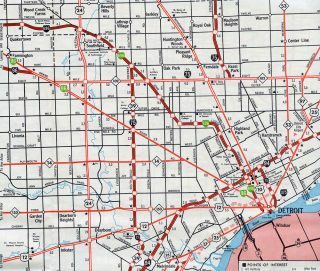 The last section of Interstate 96 (between Eagle/Grand Ledge area and east of Howell) opened to traffic in 1962.3 This 59-mile stretch of freeway replaced former U.S. 16, which subsequently was decommissioned. Within Detroit, Interstate 96 originally ended at Farmington along what later became Business Spur I-96 and is now Michigan 5 (Brighton-Farmington Expressway). The freeway defaulted onto Grand River Avenue (historic U.S. 16) just west of Middlebelt Road in Farmington Hills, with the portion leading southeast to the Jeffries Freeway at West Chicago never constructed. As part of the Gateway Project to improve the connection between Interstate 75 and the Ambassador Bridge between Detroit and Windsor, Ontario, Interstate 96 was extended beyond its terminus at Interstate 75 to the bridge into Canada. $230-million in construction began on February 25, 2008 and was completed in July 2009. Accelerated work was the result of entire shutdowns along the final mile of I-96 and a portion of I-75 as a new roadway was built to the Ambassador Bridge approach. Interstate 96 continues 1.25 miles southeast from the systems interchange with I-94 (Edsel Ford Freeway) to the ramp separation for I-75 (Fisher Freeway). Photo taken 11/06/11. A half diamond interchange precedes I-75 along I-96 east with Martin Luther King, Jr. Boulevard. The west service road joins the off-ramp with U.S. 12 (Michigan Avenue), which passes through the exchange with the Fisher Freeway. Photo taken 11/07/09. Traffic partitions into collector distributor roadways along both directions of I-75. The northbound roadway links with ramps to Rosa Parks Boulevard and M-10 (Lodge Freeway) south to Downtown Detroit. Photo taken 11/07/09. The southbound c/d roadway from I-96 connects with Vernor Highway and the tolled Ambassador Bridge spanning the Detroit River to Windsor, Ontario. Photo taken 11/07/09. An end shield previously stood at the Porter Street off-ramp from the southbound c/d roadway along Interstate 75. This ramp configuration changed with the Gateway Project. Photo taken by Dan Garnell (07/02). Paralleling M-85 (Fort Street), Interstate 75 (Fisher Freeway) makes a northwesterly turn ahead of the Ambasssador Bridge and Exit 48 with Interstate 96 (Jeffries Freeway) west. I-96 links Detroit with Lansing 86 miles to the west while I-75 leads beyond Downtown to Flint. Photo taken by Jim Teresco and Rob Foulis (08/01/01). Ramps from the Ambasssador Bridge port of entry tie into the left side collector distributor roadway (Exit 48) for I-96 west at Vernor Highway. Photo taken 11/07/09. Leading away from the turbine interchange with M-10 (Lodge Freeway) outside Downtown Detroit, I-75 advances 0.75 miles west to Interstate 96. Photo taken 11/07/09. Ramps from the Lodge Freeway to I-75 combine along a southbound distributor roadway. This roadway stays separate from the mainline to the exchange with Interstate 96. Photo taken 11/07/09. A lane drop occurs along the I-75 southbound mainline at the three-wye interchange (Exit 48) with Interstate 96. Photo taken 11/07/09. Replaced guide sign sides at Exit 49A along I-75 south. The Rosa Parks Boulevard off-ramp used to be the exit to old Tiger Stadium. Photo taken by Frank Gillon (09/03/07). Southbound Interstate 75 at I-96 prior to the Gateway Project. Photo taken by Frank Gillon (09/03/07). The distributor roadway from M-10 and the Rosa Parks Boulevard on-ramp partitions into the connections for I-96 west and I-75 south along the former U.S. 25 corridor toward Toledo, Ohio. Photo taken by Frank Gillon (09/03/07). Interstate 96 angles northwest along side Airline Highway (old U.S. 16) to U.S. 31 outside Muskegon. Photo taken 11/05/09. A pair of freeway ends signs precede the modified cloverleaf interchange (Exits 1B/A) with U.S. 31. Photo taken 11/05/09. Exit 1B departs in a half mile for U.S. 31, which extends north along a freeway 60 miles to U.S. 10 at Ludington. Photo taken 11/05/09. U.S. 31 travels along the east side of Muskegon toward Whitehall from the end of Interstate 96. Photo taken 11/05/09. Exit 1A ties into adjacent Airline Highway (old U.S. 16) northwest to Muskegon Heights and south to the on-ramp for U.S. 31 to Grand Haven and Holland. This ramp Photo taken 11/05/09. Interstate 96 transitions into U.S. 31 Business, which extends the freeway another 0.75 miles to a wye intersection with Grand Haven Road (old U.S. 31). Photo taken 11/05/09. Sign replacements at Exit 1A placed Airline Highway above U.S. 31. The ramp for U.S. 31 southbound uses a Breezewood connection via Airline Highway east. Photo taken by Dale Sanderson (2000). U.S. 31 Business (Seaway Drive) splits with Grand Haven Road (old U.S. 31) at a wye intersection and proceeds southeast along a freeway to Interstate 96 and U.S. 31 (Exits 1A/B). Photo taken 11/05/09. Exit 1A departs U.S. 31 Business south beyond the Airport Road overpass for U.S. 31 south to Holland. Photo taken 11/05/09. This sign formally marks the transition of U.S. 31 Business south to Interstate 96 east within the cloverleaf interchange (Exit 1) at U.S. 31. Photo taken 11/05/09. The previous begin shield for I-96 stood ahead of Exit 1A for Grand Haven. Photo taken by Dale Sanderson (2000). U.S. 31 advances 0.75 miles north from the commercialized interchange with Sternberg Road to Interstate 96 east and U.S. 31 Business north. Photo taken 11/05/09. An auxiliary lane opens along U.S. 31 northbound for Exit 110A and Interstate 96 east. Photo taken 11/05/09. Motorists bound for Grand Rapids part ways from U.S. 31 northbound at Exit 110A. I-96 reaches the city in 30 miles. Photo taken 11/05/09. U.S. 31 traverses an area of wetlands associated with Black Creek on the one mile approach to Exit 110A with I-96 east. Photo taken 11/05/09. Exit 110B leaves U.S. 31 south for Airline Highway (old U.S. 16), which parallels U.S. 31 Business north to Airport Road and an on-ramp for Muskegon Heights. Photo taken 11/05/09. A loop ramp (Exit 110A) joins Interstate 96 east from the ending U.S. 31 Business to Grand Rapids, Lansing and Detroit. Photo taken 11/05/09. “Road engineers plan new kind of interchange for I-96.” The Oakland Press, October 12, 2003. “Interstate roads have shaped the future for many mid-Michigan communities.” Lansing State Journal, July 23, 2006. Ambassador Bridge Gateway Project http://www.michigan.gov/gateway. MDOT project web site.